Before Europeans came to the Pendleton area, the Umatilla River valley of eastern Oregon was populated by Native Americans. The Cayuse, Umatilla, Walla Walla, and Nez Percé Indians avoided conflict and befriended early white settlers. Catholic missionaries established the earliest missions, schools, and churches in the area. The gold rush in the Blue Mountains and the coming of the railroad brought floods of settlers to the growing town. Timber and flour mills provided flourishing industries. Though the tribes were ultimately moved to a reservation, natives and whites continued to live and work companionably together. 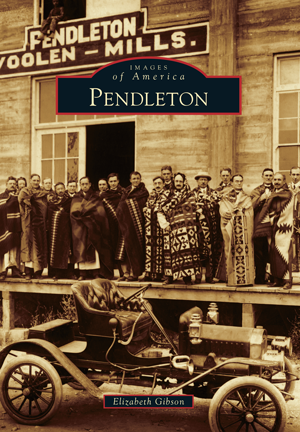 Inside these covers, over 200 photographs depict the Pendleton area from the earliest days through modern times. Many of these fine photographs would not exist if it were not for early resident Thomas Leander Moorhouse, who served as the first Indian agent on the Umatilla Reservation. He was an avid amateur photographer who left a legacy of thousands of photographs of early Pendleton. Today, Pendleton still celebrates its origins with its world-famous rodeo, and Pendleton Woolen Mills still produces its famous woolen native textiles. Elizabeth Gibson has gathered dozens of photographs to depict the unique face of this Western town in eastern Oregon.